Like a deep-fried candy bar, Piyo Blocks 2 from Big Pixel Studios is one of those apps that seems like it should be all wrong, but somehow it still manages to feel so right. Admittedly, match-3 games are just about the most over-represented genre in the App Store, but for whatever reason, Piyo Blocks 2 manages to take the old and tired song and dance and turn it into a completely magical and addictive app for the iPhone and iPod touch. For starters, although gameplay is your basic match-3 at heart, Piyo Blocks 2 shakes up the familiar formula by giving you a stupidly, delightfully wide variety of game modes. Piyo mode gives you a fairly classic arrangement, but there are detailed color-coded quotas of matches for you to fill if you want to advance to the next level. 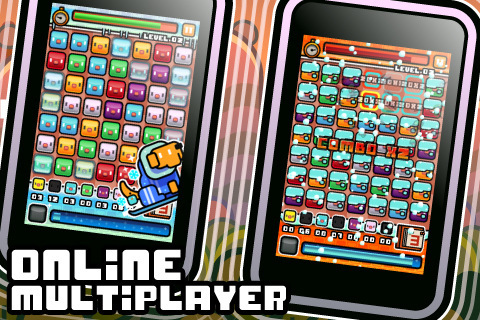 Hyaku mode is similar to Piyo, but instead you only advance after you’ve made 99 matches of any color. If you get tired of those, you can move on to Time Attack, which gives you 4 minutes to create as much chaos as possible. 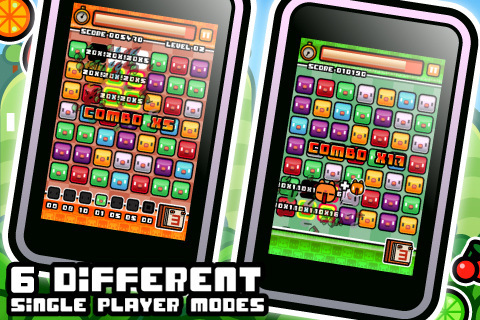 There’s also a frantic Three Second mode which gives you, surprise surprise, 3 seconds to make a match. Disco Mode randomly changes colors as you play, and there’s the old Endless standby rounding things out. There is also a robust 2-player system for local Bluetooth or WiFi play, as well as a slew of Open Feint leaderboards and achievements. In terms of features, it’s like Christmas morning in here. And the actual gameplay is fun! That is…it’s still a match-3, so you’re not going to soil yourself with excitement, but the addition of the color quotas really does add a little extra zip of challenge, and the fun bonus powerups, like exploding watermelons, are a tangy addition and help keep the action feeling fresh. The touch controls are smooth, and the interface is so beautifully clean and pretty, it’s hard not to get sucked in again and again and again. Stylistically, the game has a chic retro feel that has been buffed and polished to a bright and glossy modern sheen, and there’s just something undeniably compelling about those adorable little Piyos. Those stylized little chick icon-thingies are your match blocks and are made up of little more than a few artistically placed rectangles, but even though they’re absurdly simple, they still come across as sweet, cheerful, and brain-meltingly cute. The Piyos and the overall design’s bold, candy-colored hues give the game its significant visual pizzazz, and the light techno soundtrack, while very basic and a tad repetitive, is generally well-suited to the game. Bottom line: Usually match-3 games inspire about as much excitement in me as using a can opener, but I was utterly delighted and hooked by Piyo Blocks 2. Get this game. I mean it. It’s even on sale right now for a mere $0.99, so go and get it already! AppSafari review of Piyo Blocks 2 was written by Tracy Yonemoto on March 30th, 2011 and categorized under App Store, Games, Multiplayer, Puzzler, Strategy. Page viewed 4212 times, 1 so far today. Need help on using these apps? Please read the Help Page.